Don't forget a wand bag! This simple wand has been crafted from wild Cherry wood which was gathered from the Avebury and Swallowhead Springs area in Wiltshire. The bark on the handle has been left intact as a warm contrast to the paler inner wood. This slender and simple wand is beautifully tactile and feels so lovely to hold. The wood is from Ireland and is estimated to be around 3,000 years old. It is a beautifully deep, rich colour and feels full of positive energies. The wand is filled with hand-gathered, organically grown herbs which are traditionally considered to be sacred to the Druids: lavender, vervain, yarrow, marjoram and mugwort. The herbs are permanently sealed inside with a protective plug of mistletoe. Lavender is a powerful herb which brings peace and harmony. Vervain is a sacred cleansing and purification herb which is also believed to raise vibrations within the space. Yarrow brings its strong associations with clairvoyance and powers to promote divination. Marjoram is also added for its traditional connections with love and the heart. Mugwort has been used for millennia to aid clairvoyance and astral projection. Our ancestors drank tea made from the leaves and it has also been used in incenses or smoked to induce visions. This lightweight and simple wand is crafted from wild honeysuckle vine which features a deep natural twist formed by entwining with a branch as it grew. Honeysuckle has strong associations with the sun and follows its path through the day, leading to the spiral growth. 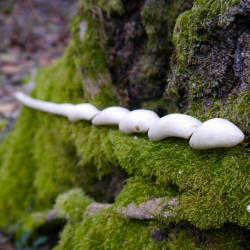 The wood helps to connect to flowing energy and has connections with immortality. This lightweight and simple wand is crafted from wild honeysuckle vine which features a deep natural twist formed by entwining with a branch as it grew. It is finished with a quartz crystal tip. This unusual wand is beautifully tactile and feels so lovely to hold. The base of the handle is carved with a detailed skull making this a simple yet powerful piece. The wood is bog oak from Ireland and is estimated to date from the Bronze age. It is a beautifully deep, rich colour and feels full of positive energies. The wand is filled with hand-gathered, organically grown herbs which are traditionally considered to be sacred to the Druids: lavender, vervain, yarrow, marjoram and mugwort. The herbs are permanently sealed inside with a protective plug of Celtic Irish bog oak. This petite and simple wand is beautifully tactile and feels so lovely to hold. The wood is from Ireland and is estimated to be around 3,000 years old. It is a beautifully deep, rich colour and feels full of positive energies. The wand is filled with hand-gathered, organically grown herbs which are traditionally considered to be sacred to the Druids: lavender, vervain, yarrow, marjoram and mugwort. The herbs are permanently sealed inside with a protective plug of blackthorn wood. This petite and simple wand is beautifully tactile and feels so lovely to hold. It is carved from naturally twisted apple wood which is a particularly rare find. The twist is formed by the branch and wild honeysuckle vine growing together. The wand is filled with hand-gathered, organically grown herbs which are traditionally considered to be sacred to the Druids: lavender, vervain, yarrow, marjoram and mugwort. The herbs are permanently sealed inside with a protective plug of hazel wood which was gathered from near to the ancient sacred site of Stonehenge in southern Britain. The wand is finished with a quartz crystal tip and has a beautifully magickal feel to it. This petite and simple wand is beautifully tactile and feels so lovely to hold. The wood is from Ireland and is some of the oldest we've worked with. It was dated through dendrochronology by Belfast University and was found to be felled in 3,023 BC at an age of 400 years which makes the wood almost five and a half thousand years old. It is a beautifully warm colour and feels full of positive energies. The wand is filled with hand-gathered, organically grown herbs which are traditionally considered to be sacred to the Druids: lavender, vervain, yarrow, marjoram and mugwort. The herbs are permanently sealed inside with a protective plug of heather. This lightweight and simple wand is carved at the base with a detailed skull. It is beautifully tactile and feels so lovely to hold. The wood is from Ireland and is some of the oldest we've worked with. It was dated through dendrochronology by Belfast University and was found to be felled in 3,023 BC at an age of 400 years which makes the wood almost five and a half thousand years old. It is a beautifully warm colour and feels full of positive energies. This petite and simple wand is beautifully tactile and feels so lovely to hold. The wood is wild honeysuckle vine which is naturally twisted by encircling a branch as it grew. Honeysuckle has strong associations with immortality, the Sun and the flow of energy. 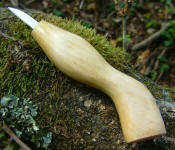 This petite and simple wand is crafted from bog yew, an ancient and unusual wood. It is around 5,000 years old. It is a beautifully warm colour with deep red tones and feels full of positive energies. This slender wand is crafted from naturally twisted wood from the Wayfaring tree - a rare and beautiful find. The wand is finished with a quartz crystal tip and will make a wonderful working tool. This simple, slender wand is crafted from juniper wood which is associated with healing and health. The wood has all the beautiful markings and graining which are so typical of juniper. This petite and simple wand is tipped with quartz and crafted from bog yew, an ancient and unusual wood. It is around 9,000 years old and from Galway in Ireland. It is a beautifully warm colour with deep red tones and feels full of positive energies. This wand is crafted from wild honeysuckle vine, magickally associated with the sun and immortality. The wood naturally contains beautiful colours with light and mid-coloured bands entwined around a deep brown core. The core is carved with the ogham symbols.